Iranian officials have reacted angrily to new U.S. sanctions, signed into law by President Donald Trump on August 2. The bill, which also deals with Russia and North Korea, directs the President to impose sanctions against Iran’s ballistic missile or WMD programs, the sale or transfer to Iran of military equipment or related technical or financial assistance, and the Islamic Revolutionary Guard Corps (IRGC). The legislation first passed in the House of Representatives on July 25 with a 419-3 vote, then passed in the Senate on July 27 with a 97-2 vote. Deputy Foreign Minister Abbas Araghchi said the move constituted a violation of the nuclear deal. 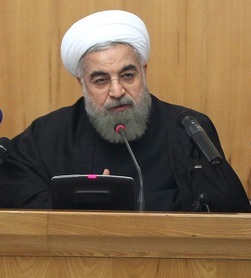 "The Americans should know that they will be harmed more by such moves, as such acts will isolate them in the world,” warned President Hassan Rouhani. The following are Iranian reactions to the sanctions. "The Americans should know that they will be harmed more by such moves, as such acts will isolate them in the world." "The recent measure by the US congress is a hostile move and the Islamic Republic of Iran will certainly adopt a decisive measure against it." "In our view the nuclear deal has been violated and we will show an appropriate and proportional reaction to this issue… …"We are definitely not going to act in a way that get us entangled in the politics of the American government and Trump."